images-naturally! : Birds in Hungary Day 6. 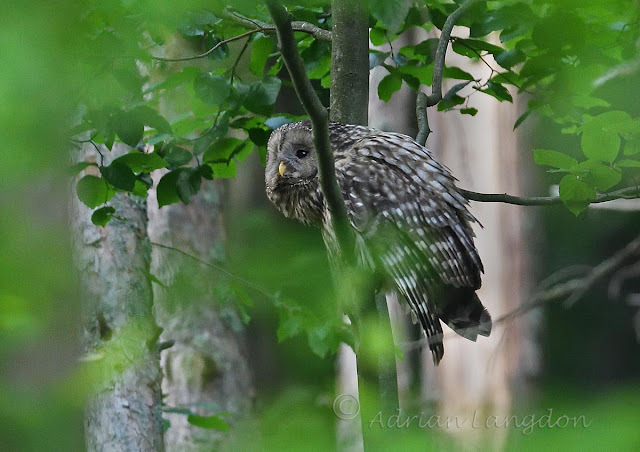 Ural Owl in the Bukk Hills. 19th May 2018. Birds in Hungary Day 6. Ural Owl in the Bukk Hills. 19th May 2018. The Ural Owl was one of our target species to photograph whilst up in the Bukk Hills region. Sadly this was the only usable photo I got and I don't think anyone else got any either. It's been a bad vole year in the forest glades and the owls haven't bred this year. That makes it very difficult to find the birds as they now wander freely across the region. Luckily our guides Attila 1 and Attila 2 managed to track one down and our illustrious leader Oliver Smart pointed this bird out to me as it perched amongst the foliage at some distance. Never going to win any awards but very pleased to add this bird to my non-existant list!